Demetri Martin performs on his "Let's Get Weird" tour (Courtesy of CBS). 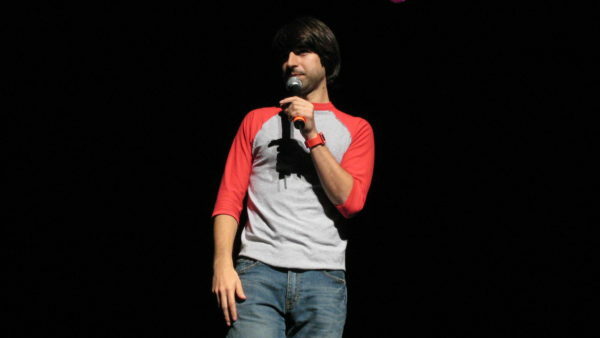 Demetri Martin performs on his “Let’s Get Weird” tour (Courtesy of CBS). Although I had high expectations, the title of his standup show alone was the most accurate indicator of the night to come. Comedian Demetri Martin embarked on his “Let’s Get Awkward” tour beginning this past summer and is currently making his way from coast to coast, leaving a trail of endearing nerdiness and soft-spoken observations at every city. I watched his one-hour set at the Uptown Theatre in Napa, California, and was expecting much of this persona to appear. I was first introduced to Demetri Martin by none other than my Netflix suggested titles. His special, “Demetri Martin: Live (At the Time),” is a full hour of the unexpected wit that casts this comedian into stardom. With only a microphone stand accompanying him on stage, his set in the special consisted of rapid-fire observations with little transitions between them on subjects ranging from tombstone engravings to hairless cats. If comedians have a trademark, Martin’s is undoubtedly his seemingly endless stream of one-liners delivered at the end of most of his shows, often in accompaniment with a joint guitar-harmonica contraption. His finale is simple: Deliver one-liners strewn with puns and wordplay, strum the guitar and resort to the harmonica any time the subject of his jokes approaches more risqué territory. The result is the perfect closure to an unconventional set that makes you appreciate satire in an entirely different light. Because of the success of his Netflix special, high expectations were set for his first stand-up show in about three years. There’s no doubt Martin is a smart guy — a graduate of Yale (and briefly a student at law school before fulfilling the risky cliché of dropping out to pursue comedy) and the creator of things like a 224-word palindrome in his spare time, in three years’ time the expectation of developing content to surpass the quality of his previous work was fully present. Match his previous content he did, but surpass it? Not so much. The jokes fired at the audience all evening were the same Demetri Martin classics that originally garnered him a fan base. While wonderfully familiar, this was precisely the issue. It was more of the same, and I was left feeling like I was still waiting on a stroke of genius. Martin’s comedic style was innovative at the time of his Netflix special and prior (such as his short-lived TV show, “Important Things with Demetri Martin,” which ran on Comedy Central from 2009-2010), seeing that many other comedians relied heavily on physical comedy or long, drawn-out recounted tales to get to their punch lines. However, the show lacked novelty that drew so many fans in three years prior. The evening was not a full-fledged disappointment. It was comfortable; residing in a space not fully reminiscent of “Live (At the Time)” but rather identical. His set brought up questions of what it means to be a comedian aiming to appease loyal devotees yet also attract and maintain a new group of supporters, and the show seemed to be caught in a middle ground that felt, put simply, a bit awkward. Just as in his special, the first three quarters of the show were filled with witty, brief observations, and the last quarter was occupied by his guitar-harmonica-one-liner trio. This format was satisfying enough but lacked the spark and innovation of “Live (At the Time)” simply because it felt like a form of imitation. Want to get awkward? Watching a comedian slightly miss his mark by relying too heavily on the past will do the trick.